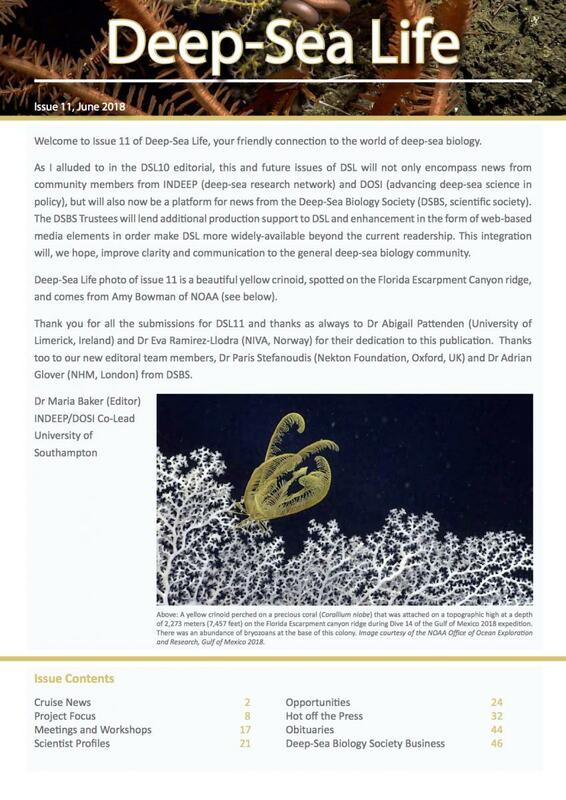 Deep-Sea Life is an informal publication for the deep-sea biology community. 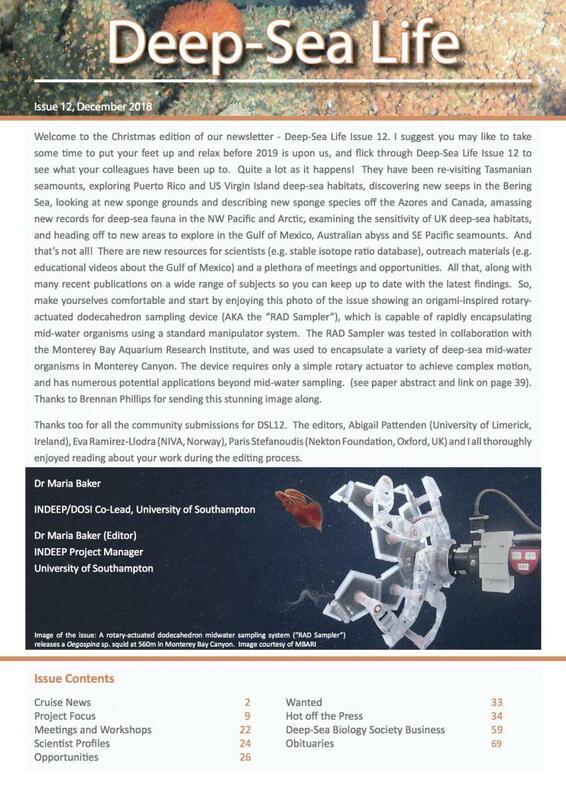 This newsletter delivers curent news regarding projects, new papers, meetings and workshops, cruises, scientist profiles, jobs and training opportunities, opinion pieces and other useful information for the science community and all interested parties. Deep-Sea Life is edited and produced by Dr Maria Baker, Dr Abigail Pattenden and Dr Eva Ramirez-Llodra. 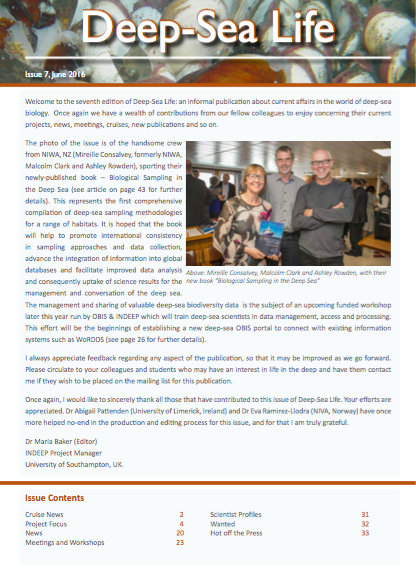 A searchable database of deep-sea experts’ profiles from across the globe has been compiled based on an INDEEP "Bridging the Gap" questionnaire prepared by Dr Maria Baker (Uni. Southampton, INDEEP project manager), Kristina Gjerde (IUCN), Lisa Levin (SIO) and Jeff Ardron. The database is now online (www.deepseaexperts.org) and is being used by all stakeholders to help bridge the gap between accurate scientific information and management of our deep oceans. The database currently has over 220 respondents. INDEEP/DOSI have created a comprehensive listing of online videos relating to the deep sea that will be of interest to the INDEEP and DOSI communities. There are links to over 250 videos specifically related to the deep sea on subjects such as climate change, ocean acidification, hypoxia, circulation, displosal (CO2, dredge spoil, litter, munitions, nuclear waste, plastics, sewage, ship wrecks and debris), exploitation (fishing, mining, oil and gas, pipelines, cables, acoustics, contamination) and exploration (biodiversity, vents, seamounts, seeps, corals, canyons, continental margins, trenches, technology, marine life). Many of these videos will be useful for teaching purposes so do have a search by subject area and see what's out there! Other useful information is also listed and searchable such as video title, presenter, affiliation, series type, duration and upload date. Are there any we've missed? If so, please let us know so we can make them available to the community. Many thanks. Link to list here. 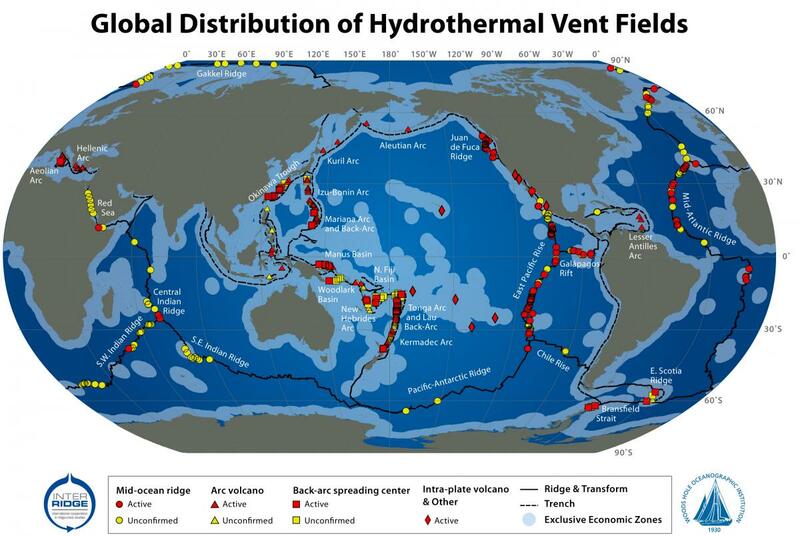 The INDEEP office has started to create a comprehensive listing of deep-sea data sources. Please contact the INDEEP office if your deep-sea data is not listed here and we will add it so that the community are able to use it. You can search on a wide range of different data types. Link to list here. Ramirez-Llodra, E., Brandt, A., Danovaro, R., De Mol, B., Escobar, E., German, C. R., Levin, L. A., Martinez Arbizu, P., Menot, L., Buhl-Mortensen, P., Narayanaswamy, B. E., Smith, C. R., Tittensor, D. P., Tyler, P. A., Vanreusel, A., and Vecchione, M.: Deep, diverse and definitely different: unique attributes of the world's largest ecosystem, Biogeosciences, 7, 2851-2899, doi:10.5194/bg-7-2851-2010, 2010. The DIVE IN series provide highly illustrated information on topics related to INDEEP objectives. In the frist issue, we present a series of briefs describing the key issues addressed by each of the 5 INDEEP working groups: Taxonomy and Evolution; Biodiversity and Biogeography; Population Connectivity; Ecosystem Function; Anthropogenic Impact and Science Policy. 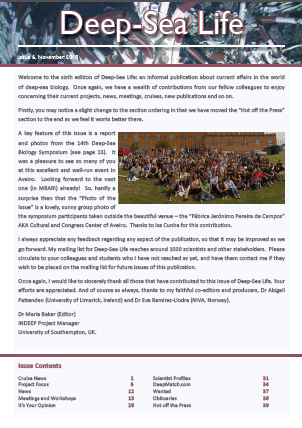 The entire back catalogue of the Deep-Sea Newsletter edited by Torben Wolff (1978-2005) is now available in scanned form via the INDEEP website (thanks to Gary Poore, Museum Victoria, Australia). This link provides a taxonomic database of deep-sea species based on the Word Register of Marien Species (WoRMS) and illsutrated with high resolution images of the fauna. This site was launched in December 2012 as an INDEEP project and it will be regularly updated. Please consider contributing identification resources. This is a field guide interface to the World Register of deep-Sea Sepcies (WoRDSS) that currently stores on your devide (for offline access) the taxonmic informaiton for over 20,000 deep-sea species, over 350 high-resolution photographs of deep-sea specimens as well as links to online taxonomic tools, sources and important references. Funders and data contributors are greatly acknowledged, including: INDEEP, WoRMS, the Natural History Museum (London) and the National Oceanography Centre, Southampton. We are especially grateful to your image providers and we welcome contributors to the next version. This identification guide for New Zealand corals has been prepared by Di Tracey (NIWA) and colleagues. This provides a summary of taxonomic features for key coral groups found in the NZ region and contains some stunning images. NOAAs Deep-Sea Coral Data Portal. NOAA has launched the Deep-Sea Coral Portal to better serve the data needs of ocean resource managers and scientists. The Data Portal has a map displaying the distribution of more than 300,000 deep-sea corals and sponges. This is the most comprehensive collection of deep-sea coral and sponge records in U.S. waters. It is built on the National Database for Deep-Sea Corals and Sponges maintained by NOAA’s Deep Sea Coral Research and Technology Program. The Monterey Bay Aquarium Research Institute (MBARI) maintains a well-established database of deep-sea observations that have been recorded by its remotely operated vehicles (ROVs) during 25+ years of operation. The database and associated software system, VARS (Video Annotation and Reference System), represents our collective knowledge and serves as an investigative tool that has facilitated hundreds of deep-sea research publications as well as countless technical, agency, educational, and outreach projects. From this unique dataset, MBARI’s video annotation team has developed the Deep-Sea Guide (DSG). The DSG is a web-based system that allows for the correlation of visual, descriptive, and observational data with environmental data from multiple sources by providing tools for searching, identifying, and examining occurrence data (e.g., depth, time, abundance) for biological, geological, and experimental observations. INDEEP is grateful to the INCISE programme (the International Network for submarine Canyon Investigation and Scientific Exchange)for sharing their comprehensive bibliography on submbaine canyons with the wider deep-sea community. This is a an impressive and useful resource for anyone with an interest in canyons. Please send any updates, changes, additions or utility suggestions to Steve Ross and Fabio Matos at rosss@uncw.edu & fmatos@ua.pt. Digital Fishers is a crowd-sourced deep-ocean science observation game. Help to contribute to our understanding of our deep-ocean environment, the biodiversity and species interactions. This guide, created by Susan Mills, Stace Beaulieu and Lauren Mullineaux (WHOI, 2007) is available as an online resource and pdf. The purpose of this guide is to assist researchers in the identification of larvae of benthic invertebrates at hydrothermal vents. This guide was co-funded by the ChEss-Census of Marine Life programme.